Pope Francis Discusses Gay Catholics: 'Who Am I To Judge?' : The Two-Way In an unusually candid news conference, the pope said gay people should be integrated into society instead of being ostracized. His view of gays is being seen as diverging from his predecessor, Pope Benedict XVI. He also divulged what he keeps in his black bag. Pope Francis returned to Rome on Monday after his trip to Brazil. 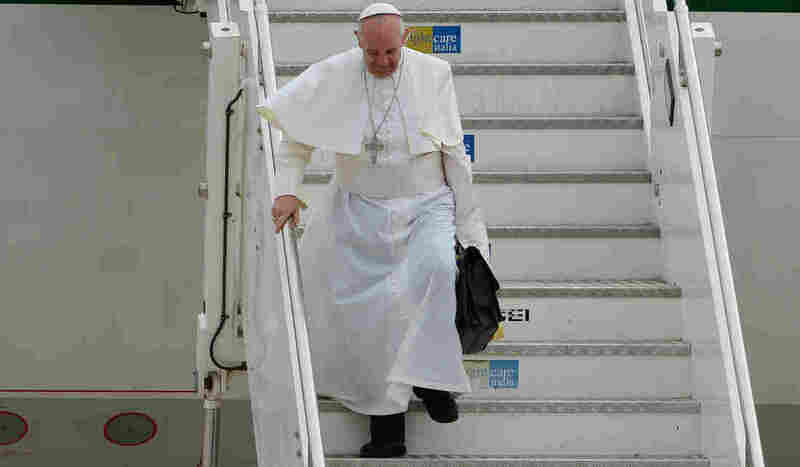 The flight included a news conference in which the pope struck a conciliatory tone about gay Catholics. He also explained what he keeps in his black bag. Gay people should be integrated into society instead of ostracized, Pope Francis told journalists after his weeklong trip to Brazil. Answering a question about reports of homosexuals in the clergy, the pope answered, "If someone is gay and he searches for the Lord and has good will, who am I to judge?" In what's being called an unusually broad and candid news conference, Francis took questions from reporters for more than an hour as he flew from Brazil to the Vatican; his plane landed Monday. One question centered on recent reports in Italian media that accused the Vatican Bank's Monsignor Battista Ricca of having an affair with a Swiss Army captain. In response, Francis said he looked into the reports but found nothing to support the allegations. The pope also used the occasion to expand on his June remarks about a "gay lobby" in the Vatican, clarifying that "he was against all lobbies, not just gay ones," the Italian news agency ANSA reports. "Being gay is a tendency. The problem is the lobby," ANSA quotes the pontiff saying. "The lobby is unacceptable, the gay one, the political one, the Masonic one." "The Catechism of the Catholic Church explains this very well," Francis said, according to the BBC. "It says they should not be marginalized because of this but that they must be integrated into society." During the news conference on the 12-hour flight home, the pope was also asked about women's role in Catholicism. Pope Francis reiterated that the Church will not ordain female priests, saying that the stance was "definitive." But he also said that the question of how to reflect the importance of women had not yet been answered fully. "It is not enough to have altar girls, women readers or women as the president of Caritas," he said, according to the Catholic Herald. "Women in the church are more important than bishops and priests," he said, in the same way that "Mary is more important than the apostles." The pontiff also addressed a less serious question: What did he have in the black bag he carried during his trip?
" 'The keys to the atomic bomb weren't in it,' Francis quipped. Rather, he said, the bag merely contained a razor, his breviary prayer book, his agenda and a book on St. Terese of Lisieux, to whom he is particularly devoted.
" 'It's normal' to carry a bag when traveling, he said. 'We have to get use to this being normal, this normalcy of life,' for a pope, he added."